A film titled ‘The Song Keepers’ was screened at the Pakistan National Council of the Arts (PNCA) here on Tuesday showing impact of the Europeans on the aboriginal communities and their cultures. The Australian High Commission had organized the screening of the film as part of the “Human Rights through Cinematography Festival” being held jointly by the European Union and the United Nations from November 25 to December 10, 2018. ‘The Song Keepers’ is a film on indigenous issues as part of the annual ‘Human Rights through Cinematography’ festival in Islamabad. It tells the uplifting story of women from the oldest known culture who are preserving some of the world’s oldest sacred songs. While speaking on the occasion, Australian High Commissioner to Pakistan Margaret Adamson noted that human rights for indigenous peoples is one of the five focus areas for Australia’s 2018-2020 term on the United Nations Human Rights Council, along with gender equality, freedom of expression, good governance and robust democratic institutions, and strong national human rights institutions. “Australia is committed to assisting indigenous peoples, both in Australia and around the world, to overcome social and economic disadvantage through our foreign policy, trade policy and overseas aid program,” Ms Adamson said. “Australia and Pakistan are working on these and a range of other issues as members of the Human Rights Council during their simultaneous Council membership,” Ms Adamson further said. 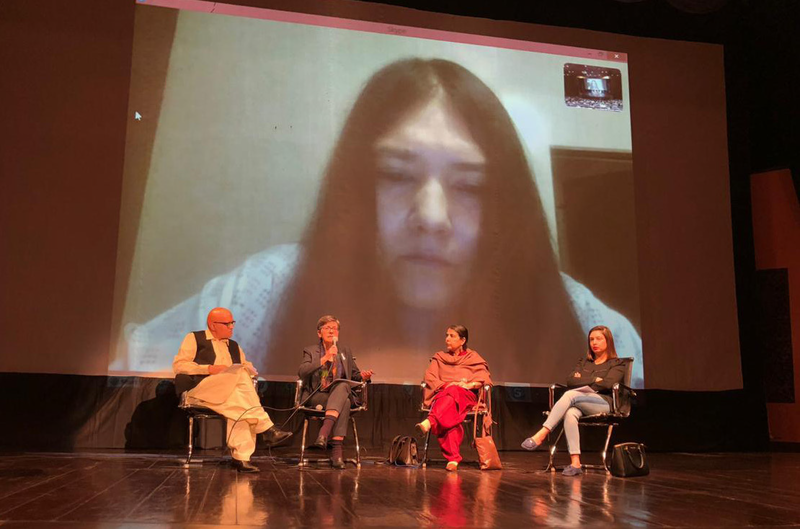 The screening was followed by a panel discussion with the Australian filmmaker, Naina Sen, and Pakistani human rights activists about the importance of cultural and religious diversity. There is a scene about an hour into Naina Sen’s documentary The Song Keepers in which a woman in her 60s ascends a ridge. The surrounding terrain is harsh desert, the red-hued country synonymous with the Australian outback. Below, nestled among the green blooms of towering eucalypts, is a patchwork of corrugated tin roofing that is the small, remote township of Areyonga. Visually the shot is sumptuous: a striking, sun-drenched panorama that alludes to the extent of isolation experienced by the Aboriginal communities that feature in the film. But that’s not all it is. The woman is Theresa Nipper, a member of the Central Australian Aboriginal Women’s Choir that is the subject of The Song Keepers. Seated on the crest of the ridge, Nipper reveals a personal history that will challenge how many viewers situate themselves in relation to the impact of colonialism on Aboriginal cultures. When Lutheran missionaries arrived in Central Australia in the 19th century with the goal of converting and assimilating the local Aboriginal people to western values and faith systems, they taught their new wards the church’s sacred hymns. What resulted was a movement of choral singing throughout the region. When the missionaries eventually departed, a commitment to the communal choirs persisted, and the Central Australian Aboriginal Women’s Choir thus is part of that legacy.